 A large hourglass which contains grains of sand of infinite shapes and colours: this is the province of Vercelli, a territory with its unusual borders that embraces the entire course of the Sesia River from the Monte Rosa to the Po River and encloses an incredible variety of landscapes and natural environments but also those with historical and artistic elements and those with numerous and amazing cultural spots. It is just for this very reason the entire area has so much to offer and to fascinate each kind of tourist; from the most curious, the most daring, the laziest to the gourmet. The southern most area is nearly entire cultivated with rice and is famous for the extraordinary spring display of the submerged rice fields: the plain is transformed into an immense chessboard of water mirrors, punctuated by farmsteads and poplar trees here and here; this is the "sea to small squares". The city of Vercelli dominates this area; rich in history, art and culture. Remarkable are its three museums, the Borgogna, the second pinacoteca(picture gallery) in Piedmont; the Leone, with its important historical and archaeological finds; and the Duomo's Treasury Museum that guards the richest shines and sacred objects. Precious and ancient are its churches, among which the Sant' Andrea's Basilica, a rare example of a fusion of Romanesque and Gothic styles; the Duomo, dedicated to its founder Sant' Eusebio, with the majestic silver and gold plated wooden crucifix dating back to the Othonian Age. Of particular artistic relief is the San Cristoforo Church (1515); the internal nave and two side aisles are decorated with valuable frescoes by Gaudenzio Ferrari: the main "Madonna degli Aranci” altar-piece, the cycles of the lives of the Virgin Mary and Mary Magdalene and the Crucifixion. The central area of the Province narrows; here rise the hills of Gattinara, noteworthy for the production of the valuable Nebbiolo grapes a part of the Terre del Nebbiolo of Northern Piedmont that gives origins to important wines, appreciated on a European level such as Gattinara docg and Bramaterra doc. Gattinara, the main centre of this section, is seat for the Regional Wine Cellar and the District for northern Piedmont wines. To the north, the territory opens and expands into the entire Sesia Valley, the same river that acted as the spectacular theatre for the 2002 World Championships of Canoeing and Kayaking and has always been loved by sports-lovers for the fabulous stretches designated for those who do river sport and for its rich waters teeming with fish. The Valsesia, "Italy's greenest valley" extends to the feet of Monte Rosa and, in winter fully satisfies the expectations of snow-lovers: there is only the embarrassment of the choice, from the skiing structure of Alagna Valsesia, a free-riding paradise, that is a part of the Monterosaski skiing district, to the new structure of the Mera's Alpe, can be reached by the chair lift Scopello. Even cross-country skiers can choose between several opportunities: the run located near Scopello, the ring-like run of more than ten kilometres Riva Valdobbia and Alagna and the accredited course for national competitions to Carcoforo. And this isn’t everything: the Valsesia offers enchanting scenery for excursions and hiking in a unique environment, in which the old traditions of the valley dwellers has been handed down in perfect harmony with the nature. Among the more captivating routes: the climb to the Regina Margherita Refuge, the highest in Europe at 4554 m, or take a walk into the Walser hamlets of Valgrande, Val Sermenza and Val Mastallone. Extensive emotions even for art and culture lovers alike: in Varallo it is possible to visit San Gaudenzio’s Colleghiate Church, the Palace of the Museums with its rich Pinacoteca (art gallery), the Calderini Museum of Natural Science and the Santa Maria delle Grazie Church with the frescoes of the life and Passions of Christ, created by Gaudenzio Ferrari. With the modern cable railway, it is possible to reach Varallo’s Sacro Monte, the oldest in Northern Italy. It is made up of fifty chapels, which represent the Passion and death of Christ with painting and life-like statues, created by great artists such as Gaudenzio Ferrari and Tanzio of Varallo. Numerous are the museums scattered throughout the entire valley, guarding important testimonies of the local culture: among which, the "Della Vedova” gallery of plaster casts in Rima, the permanent puncetto (local type of lace work made of tiny little knots) exhibit in Fobello, the Museum of Sacred Art in Campertogno and the Walser Museum in Alagna.